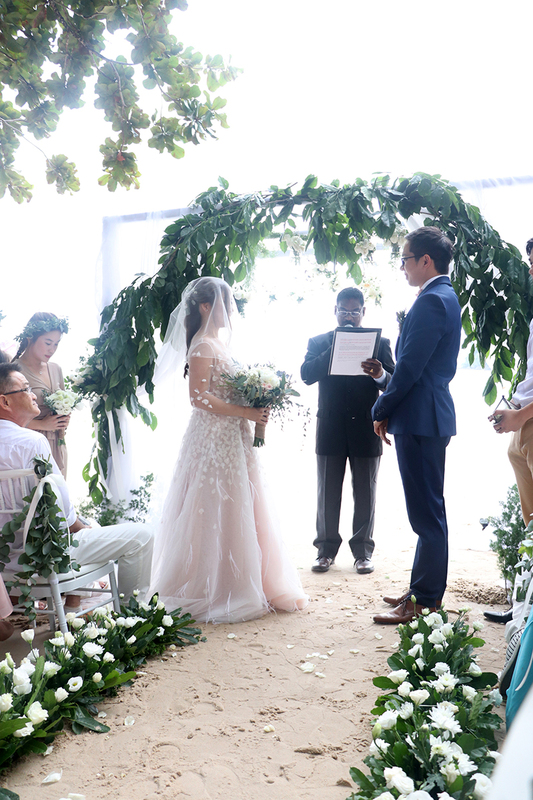 Last month, I flew over to Langkawi to witness the beautiful union of Veen Dee Tan & Lim Haan. 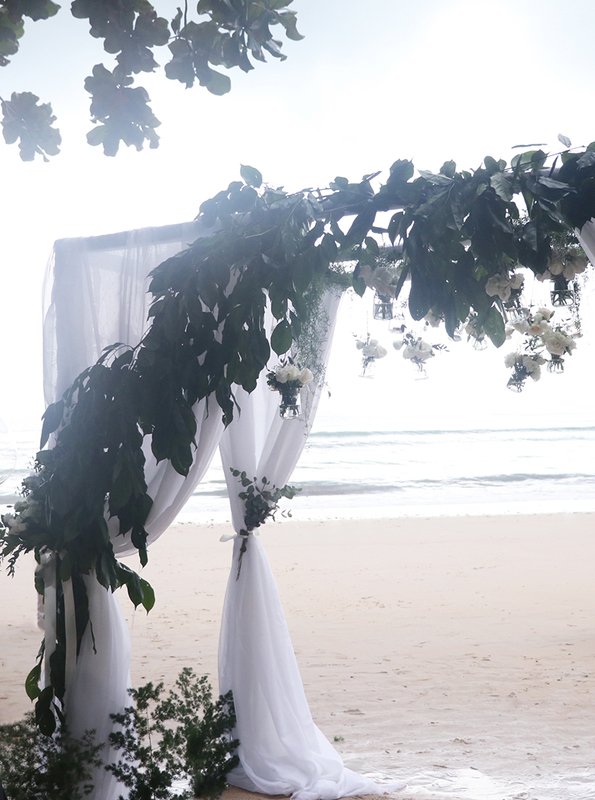 It was my first ever beach wedding and I was extremely excited to say the least. 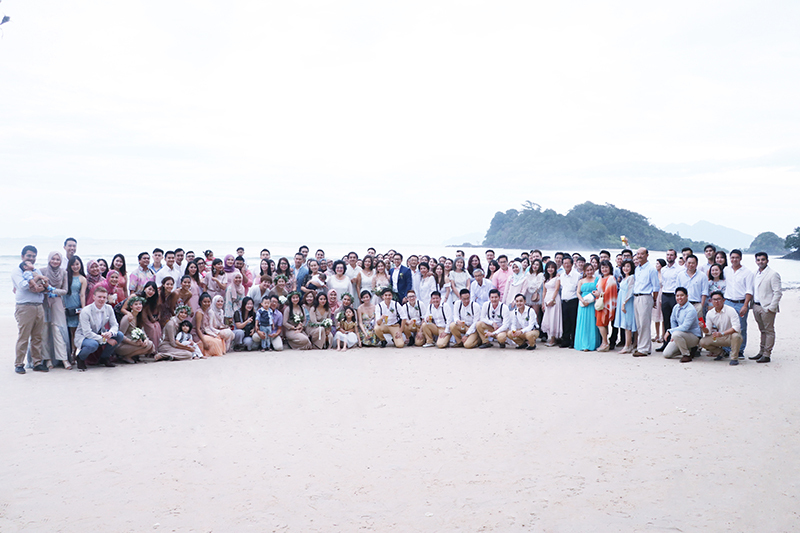 Of course it being Veen Dee's wedding is a big part of my excitement too as we have gotten closer throughout the years. 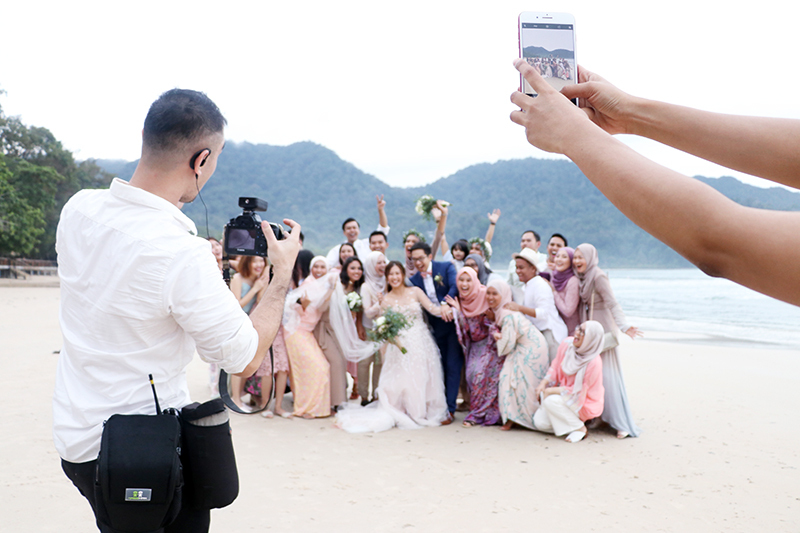 The moment she sent me her out-of-this-world save the date card in March earlier this year, I decided to book the flights to Langkawi right away for my lil family as I didn't want to miss it. And when she sent out a link about the packages for the Andaman Hotel, we booked it right away too. It was also Elhan's first ride ever on the plane and his first time going to an island. On the chosen wedding date of 23rd September 2017, everything was lovely. 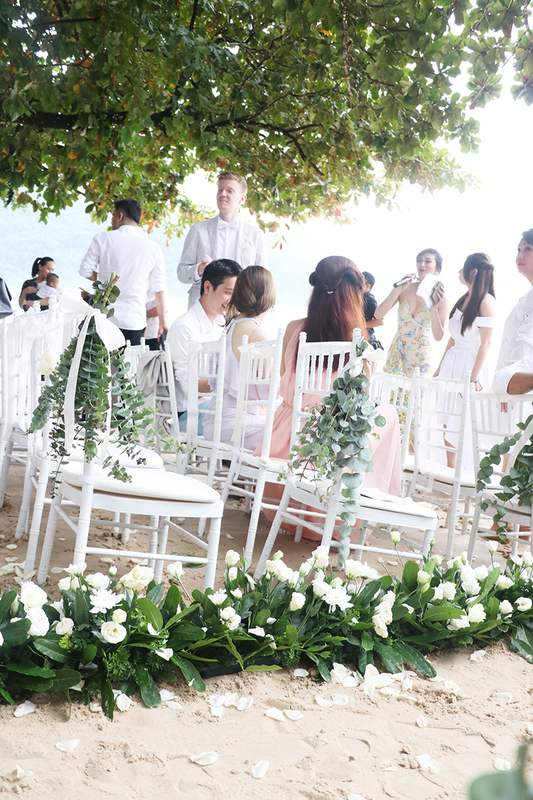 Everyone looked so beautiful and in theme, and the bride and groom, the gorgeous couple looked amazing and happy. I can't count the number of times I cried and laughed at the event (its not just me okay, everyone else cried too) It was so touching, heart-tugging and heartwarming. I felt so, so much love on that day. I managed to record some moments from the wedding from my seat, and while I was posting this I looked at it again and teared and laughed again. Enjoying the sea breeze and the view before the event started. I got to know Veen Dee just over 3 years ago when I was experiencing a series of life changing moments and we clicked right away as to me, she's someone who is honest, frank, funny and sweet. She doesn't mind telling me the truth even if it hurts. We knew each other from work first and of course when we're working we have similar personalities - we're both serious, passionate and head strong. We usually end up stressing each other out with our creative differences and different opinions, but I guess for us we both respect each other's view point, agree to disagree and made sure to not let work affect our friendship. However, as we got closer personally, I know that I have been blessed to have this beautiful selfless soul as a friend. Though we have only known each other for 3 years, but for as long as I've known her she has always been there for me, cheering me up at my lowest point and has also been there to share one of the happiest days of my life. I still remember the happiest reaction from Veen Dee when she found out about my second pregnancy. She literally screamed! And I was like "lower it down sis, its a secret!" Hui Chin was there too. And then when it got complicated and I was on strict bed rest she visited me and even cooked for me just a day before my birthday. And then when I lost Baby Adik (Read here and here) and was in my mini confinement she also came to just be there with me watching random funny YouTube videos with Marissa. And I'm sure everyone agrees that not many people will be there to support you when times are hard compared to good times, so for all this and more I'm thankful to have known Veen Dee. 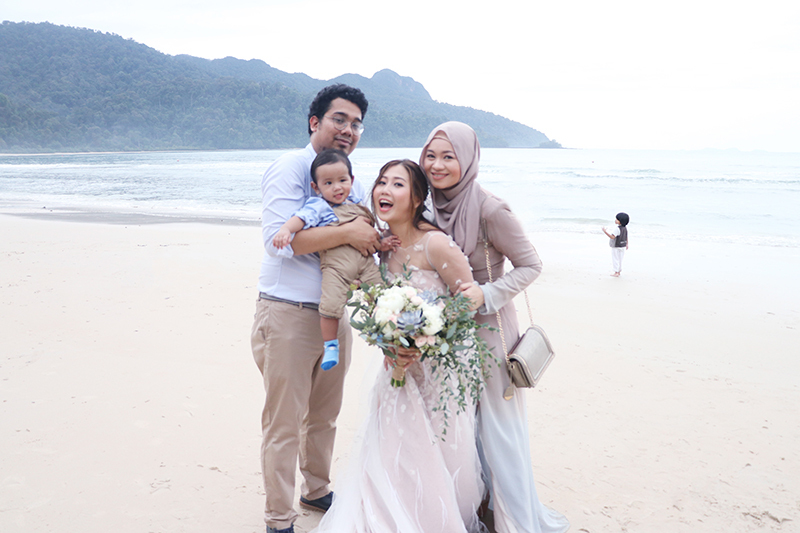 She was the first friend to visit my son Elhan (read here) when he was born, she was the first friend to meet Elhan on the day Khubayb and I brought him back home and my son was also there to celebrate her special day in Langkawi. It was his first plane ride and he was so happy and excited to see Aunty Veen Dee the night before the wedding in her room! Veen Dee is someone who would go out of her way, sacrificing everything else for the person that she cares about or loves. As a friend I can definitely testify to that. I don't think I can ever be as good a friend to her. For that, and all that she is, I feel that Veen Dee deserves all the good things that life has to offer. And I'm truly very happy that she has found the man of her dreams and will now live and die with the love of her life. Congratulations to you both and I wish you all the happiness, love and joy till the end of time. Happy honeymooning, lovebirds!!! Miss you so much already Veen Dee, and like I said earlier, I know you're married and all, but don't forget me k! LOVE YOUUUU! 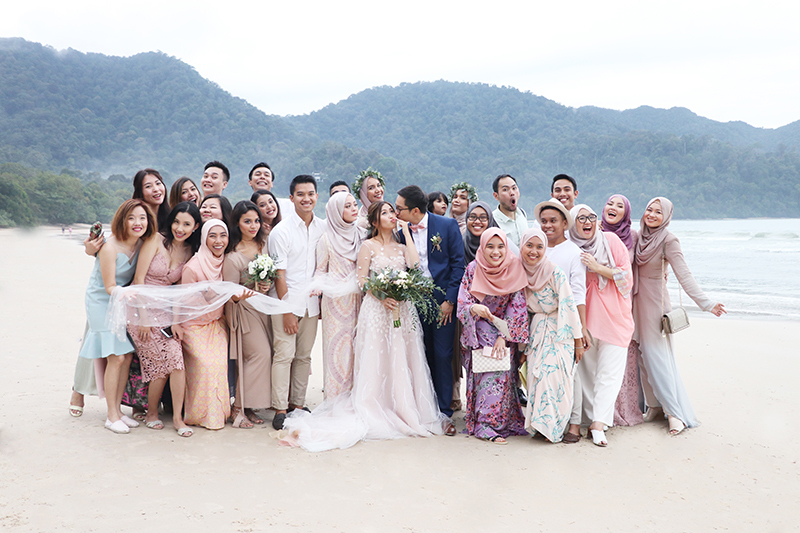 Thank you so much for having me at your wedding and thank you so much for bringing everyone from KL mostly and different parts of the world to Langkawi on your wedding weekend. 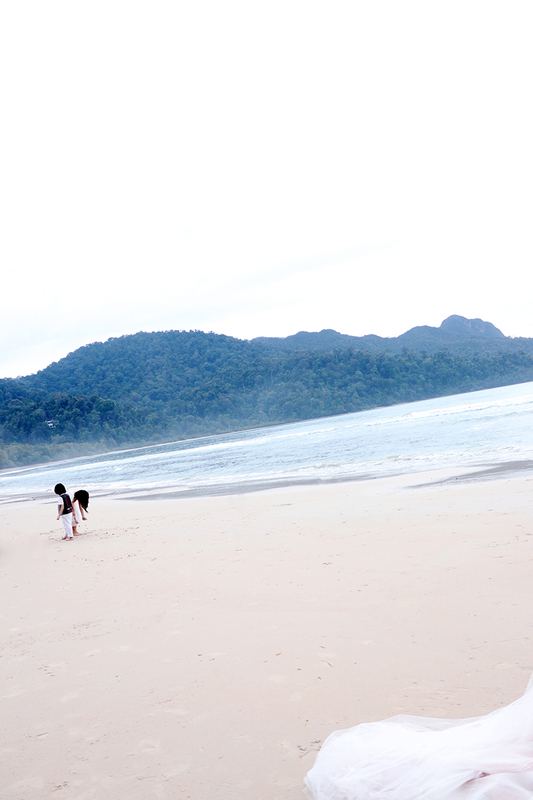 It is one of the best, fulfilling and satisfying trips for me personally. More videos and photos from the memorable day below, but first : The entrance featuring the bridesmaids (most are also my friends), bride and groom walking down the aisle. From my seat while waiting for the ceremony to start. One for the album with the happy, beautiful and handsome newlyweds. 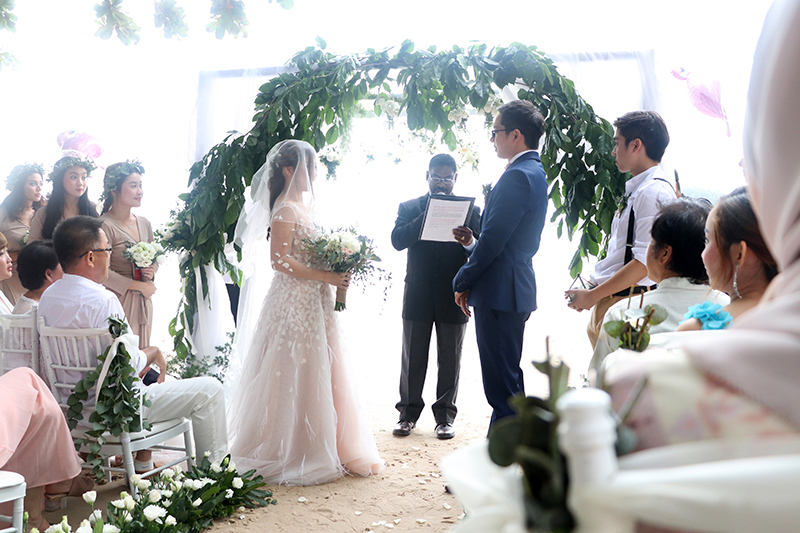 And below is the video of the I Dos, the heart-tugging vows which made most of us teared tears of happiness and also laughed too, Veen Dee being the funny person that she is, the ring or what we call upacara sarong cincin (but I don't know how to say it in English), the kiss and them running away from the aisle! That last bit Veen Dee and Haan seems so happy! Love them both #jajanotdada and #dadanotjaja. One have teared for me when she found out a personal good news about me and one have comforted me during one of the most painful moments in my life. Not only do they complete each other and complement each other as twins they have amazing souls and provide the greatest support and love to those around them as well. Blessed to know both of them. Two friends that I love and miss so much too! That happy moment after the marriage ceremony was just done. Such a beautiful moment. I took this photo with my phone while I was recording the video I shared. Friends who all came from KL. One for the album with all the guests. All! Everyone was asked to be in this shot. Photo by the official photog using my camera, because I will always ask someone to help me take a photo using my camera hehe. Another lovely friend that I so miss huhu. Kind beautiful soul, Marissa Zamani. The first to know face to face about my second pregnancy (after Khubayb of course) (that's seriously a big deal as I kept it a secret for so long). We couldn't contain our excitement that time and also she was one of the very few who showed support at my home when I lost that pregnancy almost 2 years ago. One of the few people whom I can open up to about how I dealt with the loss at that time without any judgmental looks. How can I not be more thankful to have a good friend who has been there for me through ups and downs when a lot of people just run away or are scared of this kind of big changes. Huhu. Much love! Don't you dare be confused! Before the event started. Elhan's OOTD gifted by Aunty Patricia recently. Vivy's expression on how Haan is stealing Veen Dee from all her friends. Priceless! Elhan in between his naps. Sleepy face. I actually wanted to take a photo of Veen Dee in her jaw-dropping gorgeous dress by Khoon Hooi alone but it was so hard to get after the ceremony as everyone was just chasing her to hug, congratulate and take photos so here are photos of her with beautiful people Ibnu Aswan (above) and Jenn Low (below). 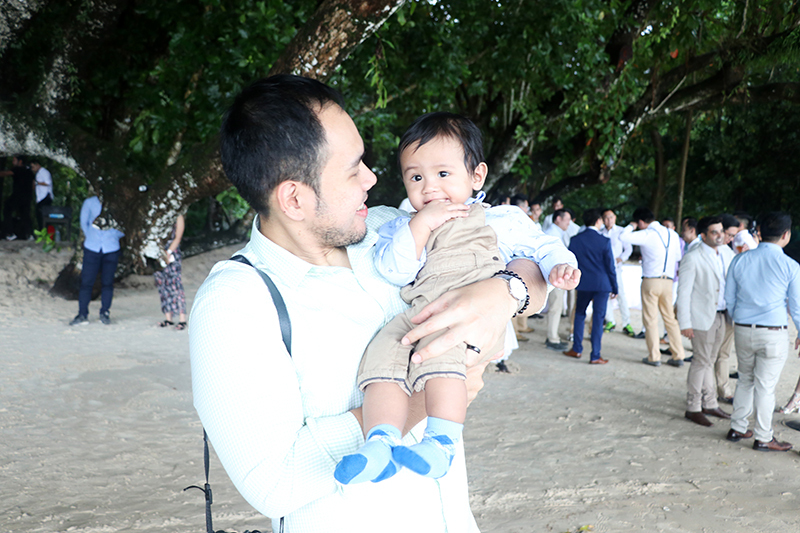 Elhan with one of his fav uncles, Uncle Ibs. Also one of my few close guy friends whom I can talk to about deep stuffs but at the same time can be silly about. Thanks for being there for me throughout some rough times Ibs! Also the one who took all the photos of me with Jaja and Dada in this post. 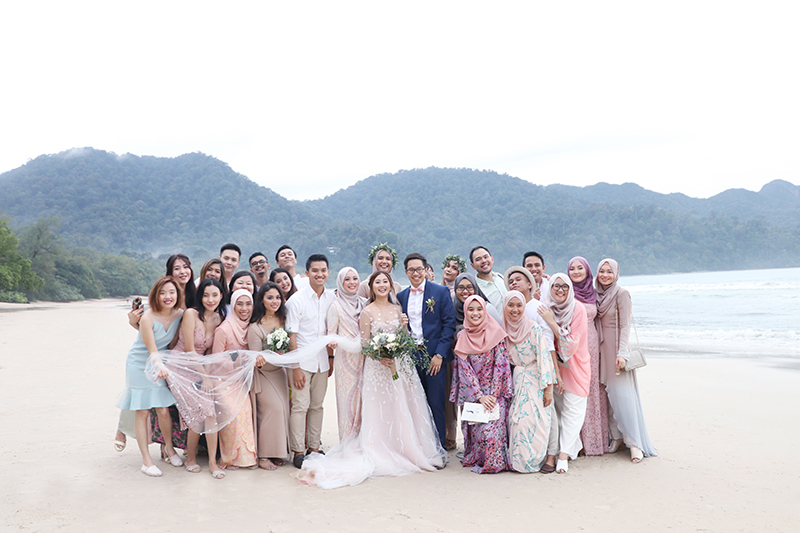 That's a hint of Veen Dee's veil on the sand with Afeef (Jaja) and Dian (Dada) at the background. Everything was spot-on perfect at our wedding. And this was due in large part to their manager and the amazing staff. Very professional staff at Seattle Wedding venues, incredible food, spectacular view and when you felt like a guest at your wedding it cannot get any better.